I spent last weekend in South Beach, Miami, for my dear friend MM's bachelorette party, and having eaten, tanned, and drank to gluttonous levels, I'd highly recommend it as a girls' weekend destination. Unusually for me, I did very little shopping over the weekend (aside from a Mango store, a Barneys Coop, and a few other chain stores, South Beach has a disproportionate amount of Eurotrashy shops). But while I was having my heavenly massage at the Delano's excellent Agua spa, my masseuse wrapped me in the softest, fluffiest blanket I've ever felt. So of course I had to buy one. My blanket is made by Kashwére, a company dedicated to achieving the softness of cashmere with the durability of synthetics (my blanket is made from microfiber). 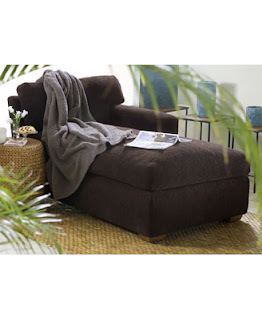 So I was happy to discover their website, which sells not only my blanket (and I'm happy to report that I paid even less for it at the Delano than the price listed here), but all manner of clothing, accessories, furniture, and decorative items for the home--everything from sweaters to sofas. Based on the softness of my blanket, I am tempted to buy one of everything, but because of the prices (hey, you get what you pay for! ), I will refrain. Still, some items are simply irresistible, like this robe, which, if I bought, I'm almost certain I'd never want to change out of in the morning. Ditto for these slippers, which are clearly from the Ugg school of ugly comfort. 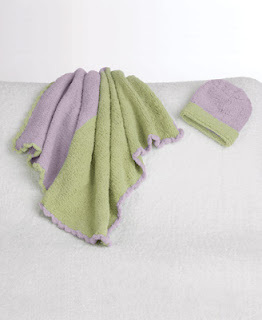 I tend to knit baby blankets and hats as gifts, but if I'm feeling lazy, I could substitute this adorable cap and blanket set without a guilty conscience. But my dream item is this slipcovered chaise. Just imagine sinking into it and feeling like you're floating on a soft, fluffy microfiber cloud. Seriously, though, I think if you ever got me into this thing, you'd never get me out. But that's okay, because I'd be wearing my Cashwére robe and slippers, with my throw blanket on my lap. And I think I'd be in a microfiber coma. But a blissful one.